Go find your own picnic basket! Nature documentaries have long been a staple of elementary school classrooms and Sunday afternoon television programming. They’re a great, if occasionally dry, way to learn about the many species with whom we share the planet. DisneyNature has been moving the genre into new, exciting directions in recent years, using high-tech cameras and other modern equipment to put viewers right next to their subjects. Films like Chimpanzee, African Cats, Oceans, and Crimson Wing have all provided amazing sights that both enthrall and inform. The company’s latest, Bears, is no exception. 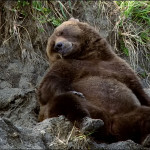 Narrated by John C. Reilly, the movie follows a bear family in Alaska through a year of their life. 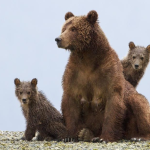 It opens with a mama bear, whom the filmmakers have dubbed Sky, coming out of hibernation with her two cubs, Scout and Amber. Sky sets out on a mission to get enough food so that she will be able to continue to feed them during the next period of hibernation. The family digs for clams in a mud flat, snacks on mussels, and, in the film’s centerpiece sequence, tries to catch salmon that are swimming upriver. There are perils along the way, including an avalanche and a wolf pack. There’s also an aggressive male bear who’s so hungry that Scout and Amber start to look appetizing. Reilly tells us in narration that only about half the bear cubs born into the world survive their first year, and we can see why. Bears offers many breathtaking sights. The filmmakers have somehow managed to get close to the bears, but not close enough to disrupt their day-to-day existence. A few of the moments are unexpectedly funny, as when Scout gets a clam stuck on his claw and can’t get it off. 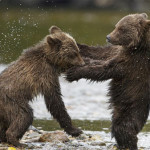 Others are frightening, such as a tense scene in which two grown bears get into a fight that sends fur flying. Still others are touching. At times, we can really observe the protectiveness of Sky and the way she prepares her offspring for the harsh realities of nature. The photography is crystal clear, often getting in so tight on the bears that you feel as though you could reach out and touch them. The arms-length style of nature documentaries from earlier eras has been replaced with something much more intimate. This, in turn, provides Bears with its most indispensable quality: wonder. As with a curious child, the movie displays genuine fascination with the central creatures and what their lives are like. The footage has been lovingly assembled to create one Wow! moment after another. Most dazzling is the salmon scene, which uses slow-motion shots of fish jumping out of the water and smacking into the faces of the bears that are attempting to ensnare them in their jaws. There is perhaps a bit too much narration here. In addition to simply explaining what the bears are doing in key spots, Reilly is asked to say silly, anthropomorphic lines, as though verbalizing the animals’ thoughts. That doesn’t really work, and it certainly isn’t necessary. Some sequences have also been edited to make things either more humorous or more menacing than they probably really were. The gold standard of nature documentaries is March of the Penguins, which revealed an almost unfathomably complex annual ritual performed by the birds it followed. Bears doesn’t have an arc anywhere near that majestic; it’s basically an “eat and survive” story. Not that those minor quibbles matter much. The point of Bears is to see bears, up close and in all their glory, doing all the things bears do (minus that thing they ostensibly do in the woods). On that count, the film succeeds marvelously. It is a visual experience through and through, one that offers eye-popping delights at every turn. The Blu-ray/DVD combo includes copious making-of extras that show how the filmmakers got these shots without getting eaten.